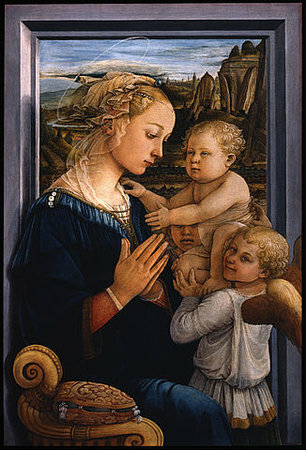 In this painting by Fra Filippo Lippi, Madonna and Child with Two Angels—a variation on the Madonna and Child Enthroned (see Giotto or Cimabue) that artists have been painting for hundreds of years—halos virtually disappear. Mary’s hands are clasped in prayer, and both she and the Christ child appear lost in thought, but otherwise the figures have become so human that we almost feel as though we are looking at a portrait. The angels look especially playful, and the one in the foreground seems like he might giggle as he looks out at us. 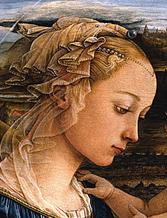 The delicate swirls of transparent fabric that move around Mary’s face and shoulders are a new decorative element that Lippi brings to Early Renaissance painting—something that will be important to his student, Botticelli. However, the modeling of Mary’s form—from the bulk and solidity of her body to the careful folds of drapery around her lap—reveal Masaccio’s influence. It is said that Fra Filippo was so lustful that he would give anything to enjoy a woman he wanted if he thought he could have his way, and if he couldn’t buy what he wanted, then he would cool his passion by painting her portrait and reasoning with himself. His lust was so violent that when it took hold of him he could never concentrate on his work. Because of this, when he was doing something for Cosimo de’ Medici, Cosimo had him locked in so he wouldn’t wander off. After he had been confined for a few days, Fra Filippo’s amorous, or rather animal, instincts drove him one night to seize a pair of scissors, make a rope from his own bedsheets, and escape through a window to pursue his own pleasures for days on end! So Lippi runs away from his patron, “to pursue his own pleasures,” but he HAD to run away, since Cosimo (his patron) had him locked up! Now, could you lock up Picasso and say “you must finish this painting by next week?” Of course not, art is not made that way—according to our contemporary understanding of art, artists need to be inspired; they can’t be ordered to create, the way you would order a pizza or a birthday cake. What Vasari’s story is really about is a change in the status of the artist—and a related change in the way people are thinking about art. Art is beginning to be thought of not just as something made by a skilled worker, but something that comes from a “inspired” place—from someone who is especially gifted. According to the rest of the story, Cosimo de Medici (Lippi’s patron) learned that artists need to be treated with respect—a sign of the changing status of the artist in the Renaissance—from skilled laborer to respected professional and intellectual. Another biography of the artist from The National Gallery of Art, Washington D.C. Cite this page as: Dr. Beth Harris and Dr. Steven Zucker, "Fra Filippo Lippi, Madonna and Child with Two Angels," in Smarthistory, August 9, 2015, accessed April 23, 2019, https://smarthistory.org/lippi-madonna-and-child-with-two-angels/.